Medfield junior forward Mike Tyer (24) protects the puck and cuts towards the cage during the Warriors 4-2 victory over Dover-Sherborn/Weston on Saturday afternoon in Franklin. 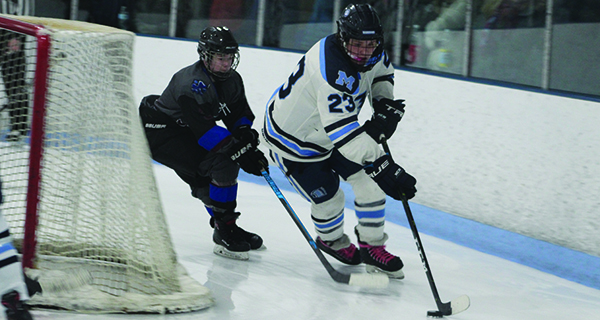 Medfield’s Phil Parker (23) shields the puck from DS/Weston’s Connor Burke (3). Two old friends met on Saturday afternoon in Franklin as the Medfield boys varsity hockey team hosted Dover-Sherborn/Weston at Pirelli Arena. The Raiders (7-8-2, 5-7-1) entered looking to win their third straight and in big need of a resume-boosting win with the state tournament rapidly approaching. Meanwhile, the Warriors (11-1-4, 9-0-4) came into Saturday eying both the TVL large title and the top overall seed in Division II South. Thanks to a late goal by sophomore forward James Wilder, the Warriors were able to hold off their arch-rivals, 4-2, for their 11th win of the season. With 8:30 to play in the opening period, senior captain/forward Shawn MacTavish sniped home a goal on a two-on-one bid to give the Warriors an early 1-0 lead. Just 2:29 later with 6:01 remaining, Cooper Griffin responded for DS/Weston when the junior flew in on a breakaway and shot the puck home up high to tie the game at one. Exactly a minute later with 1:29 remaining in the period, Matt Paolatto gave DS/Weston the lead when the senior captain smacked home a rebound off of an initial shot off the face-off. With time winding down in the period, Medfield rushed the puck up the ice and dumped it on cage. The rebound caromed out into the slot and Ben Kerivan was there to hammer the puck home just before time expired in the period, tying the game at two at the end of one. The game remained scoreless after both teams played an extremely defensive second period. With 9:54 to play in the third, Wilder potted home a goal on a rebound to give Medfield back the lead at 3-2. Dover-Sherborn yanked goaltender Zach Korbin from the net for an extra attacker with just under a minute to play for a six-on-four advantage following a Medfield penalty. With 5.3 seconds remaining, Mike Tyer sealed the deal by shooting home the empty netter from the neutral zone to give Medfield 4-2 lead and a two-goal victory. Senior forward Steve O’Leary (8) gets a shot off through traffic. 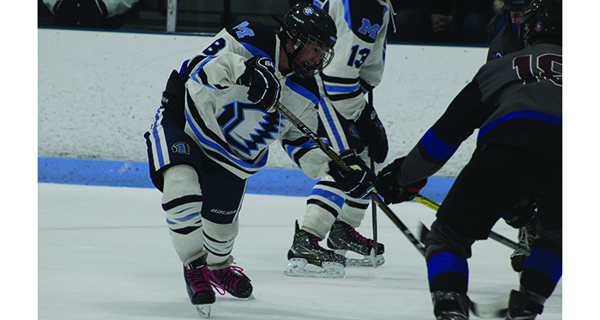 DS/Weston will look to get back on track at Bellingham on February 16, while Medfield will look to wrap up the TVL large title against Norwood the same night.